Earlier today, CORD leaders held a press conference in which a very serious and distressing statement was issued. As always, a progressive minded has submitted to Blog Admin the following exclusive evidence that the local media has not yet aired. The stage is being set by the Jubilee government to reintroduce state sponsored terror activities under the guise of national security. This is a combination of the horrors witnessed in both Jomo Kenyatta and Daniel Moi regimes, as they went about muzzling dissenting opinion, constructive state criticism and general oppression of civil freedoms. 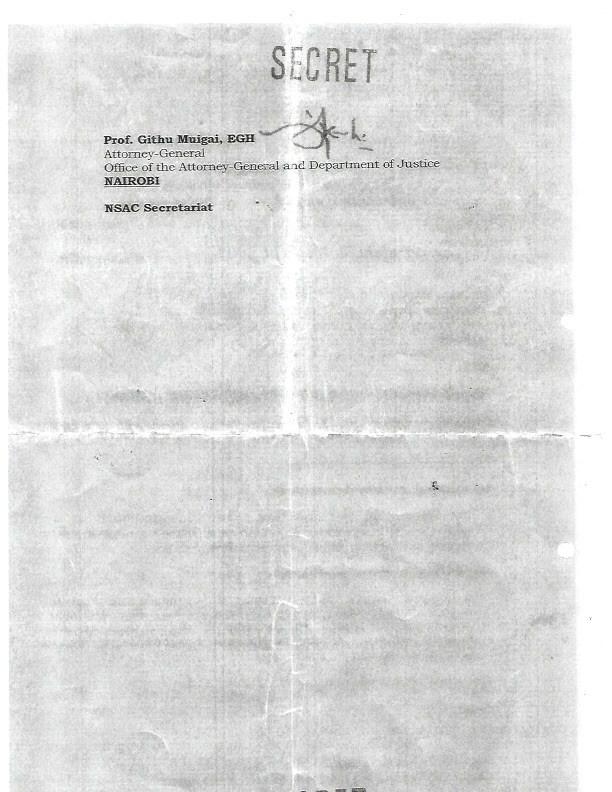 We are in possession of a copy of a letter dated 24th June 2014 written by Mr. Joseph K. Kinyua, the Chief of Staff and Head of Public Service and addressed to Njee Muturi, the Solicitor General and copied to Prof. Githu Muigai, the Attorney General whose contents are extremely disturbing and constitutes a drastic reversal of the democratic gains attained by the enactment of the New Constitution. The letter demonstrates the desire and scheme of the Jubilee administration to use the law of treason to achieve political objectives, unrelated and extraneous to the principles and jurisprudence of Kenya’s criminal justice system. 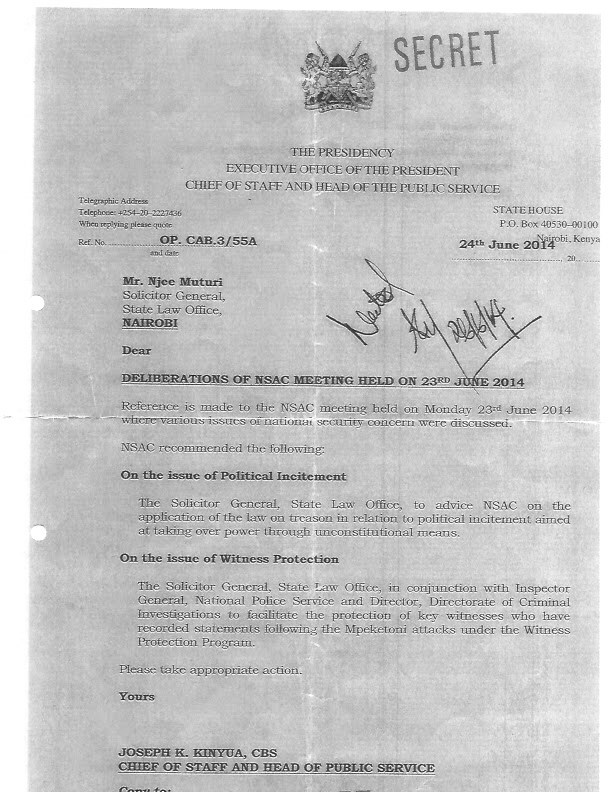 This letter is the clearest indication that the Jubilee administration wants to arrest and detain the leaders of CORD on charges that have no basis in our Constitution and the law in order to emasculate the opposition and give the regime opportunity to introduce the imperial presidency and despotic rule. We are also concerned that this initiative by NASC excludes the office of the Director of Public Prosecution, a constitutional and independent office with the mandate to institute and undertake or to withdraw and terminate criminal prosecutions. The Governor of Lamu county was recently arrested and detained without charges on the pretext that he would be arraigned on offenses under International Crimes Act. No such charges have been preferred to date. This was a case of politics and the Governor should be left alone so that he can continue with his work in Lamu. In 1997 the law of sedition was repealed from our Penal Code under Act No. 10 of 1997 because of the trend in those years of dragging Kenyans into criminal courts under that law. The law of detention without trial has also been replaced. The Jubilee regime cannot be allowed to take Kenya back to the dark old days where state terror was directed against patriotic Kenyans who were struggling against dictatorship and injustice in the name of state security. CORD remains firm and steadfast in its commitment to make Kenya a better place to live in and no amount of intimidation or harassment will compromise CORD’s relentless struggle to enable the people of Kenya reap the fruits of the New Constitution. Finally we are concerned about the membership of the National Security Council and the National Security Advisory Committee which does not portray the face of Kenya and is prone to fall prey to the advancement of a parochial and hegemonic agenda in the country to the detriment of national unity. The Kenyan people are presently confronted with extremely difficult times – runaway insecurity, high costs of living, rising unemployment, obscene disparities in individual incomes, dishonest leaders in both national and county governments and a captive citizenry. These are complex problems. They need complex solutions. But in the fashion that is uniquely Kenyan, we proffer simple and simplistic solutions thereto. The most outrageous of these is the militarization of our national security and reverting to the past to solve problems of now and tomorrow. In the Statute Law Miscellaneous (Amendment) Bill 2014, the Uhuru Kenyatta government seeks to amend or alter motley of legislation. Among the Acts of Parliament it seeks to amend are the Kenya Defence Forces Act and National Intelligence Services Act. The changes envisaged in these so-called miscellaneous amendments are not miscellaneous – they are fundamental. They not only reverse almost all the gains made by the people of Kenya in the democratization and professionalization of the security sector but are also a direct assault on the Constitution of Kenya. In this omnibus Bill, the state proposes to amend the law so as to do away with parliamentary oversight by giving the President and Defence Cabinet Secretary powers to unilaterally order military interventions and operations inside the country without the approval of the National Parliament.This is a road to national disaster but paved with good intentions like the road to hell. Coming in the wake of announced intention of the Kenyatta government to establish a Nairobi Metropolitan Military Command as part of thesolution to the country’s security problems, Kenyans should be afraid. Let’s be very worried. Let truth be said. This Nairobi Metropolitan thing is euphemism for a presidential guard in the mold of Yoweri Museveni’s and Salvar Kiir’s elite units. As one with a fleeting knowledge of security but having observed the operations of elite military squads employed to police national citizenry in the cited neighbouring countries and elsewhere, I can state,without fear of contradiction, that we are courting a national disaster. In my humble view the militarization of our national security is such a huge step backward that is unprecedented even under the Jomo and Moi raw dictatorships. Deploying the military to police our neighbourhoods without seeking parliamentary approval is a grave affront to our Constitution. It could lead to unprecedented human rights violations. Besides its potential to undermine the weak civilian institutions, this decision would trigger or aggravate mistrust between various security agencies. I have had the privilege of dealing with our national law enforcement agencies at close range and am aware of the mutual mistrust among them – especially given the semi-militarisation of some services or detachments. Bringing in the full military personnel with no law enforcement training is like rubbing pilipili into a raw wound. We should also be wary of giving the President a blank cheque to deploy the military without properly defining what constitutes a‘national security threat.’ In a country where the borderline between national and personal political interests is so thin, there are fears of the military being misused by current or future presidents to further causes that have nothing to do with public interest. The high levels of political, ethnic,religious and socio-economic polarization of this country further exacerbate this situation. The Constitution of Kenya 2010 explicitly restricts the use of the military in law enforcement duties, and for good reasons. The roles of the police and the military are not interchangeable. They should so remain. The changes sought in the amendment to the National Intelligence Services Act are equally far-reaching and backward. Among others,they seek to remove the requirement that the NIS should obtain court orders before arresting a crime suspect; to abrogate the right to privacy of persons subject to investigations by the service, including tapping of their phones and hacking their electronic communication; and limiting the oversight role of the National Security Council over key decisions of and concerning the NIS. Currently, the monitoring of personal communication is limited to persons suspected of having committed crimes. Since in theory every Kenyan is subject to NIS watch, this proposed amendment gives the service a licence to violate our right privacy at will. Are we back to the days of the dreaded Special Branch? Many well meaning Kenyans are faced with the depressing prospect of watching as the gains made in a lifetime – the triumph of freedom over tyranny, the enactment of a new liberating national constitution, the devolution of political power and resources from a choking centre to devolved units and the freeing of the media from the clutches of censorship – all reversed in one fell swoop by an overbearing and reactionary Executive. We are about to witness hopes of young Kenyans dimmed and opportunities for a free and progressive future diminished beyond imagination. A sense of bleakness and barrenness of life now pervades the existence, actions and reflections of even the most optimistic amongst us. Many who are still politically active are thoroughly discouraged. Scores of young Kenyans on the brink of political engagement are made to wonder, ‘What is the point?and turn away disheartened and isolated. Dear Kenyans, reject this swift and steady slide back to the dark past. Following the Westgate attacks, several of us provided pointers to the real possibility of an inside-job – at least in the Jubilee government deliberately ignoring credible intelligence (including a report by Nairobi Senator Sonko) about the impending attack. This was to basically ALLOW the attack to occur and kill as many civilians – enough to attract global attention on the need to have ICC-charged leaders excused from the Hague trial to attend to al-Shabab terrorism. Maj. Gen. Gichangi publicly stated that NSIS actually shared the intelligence of impending Westgate attacks with security agencies. Kenyatta pointedly refused to allow an official inquiry and public expose of the report. Our state security apparatuses are being abused at the whims of covering the personal woes of the ICC-indicted President. Folks also postulated about the possibility of yet another inside-job (turning a blind eye to intelligence) being perpetrated in the Lamu/Mpeketoni violence – to advance both international and domestic political, economic (land) and security agenda. Having allowed these Lamu killings to go on day-in-day-out, a new narrative has sunk. Going against credible and overwhelming evidence, Kenyatta is advancing the propaganda that his Agikuyu tribesmen are being slaughtered in Lamu by political opponents in the Opposition. Firstly, Kenyans from many communities, not just Agikuyu, have been victims of murder and torture at Lamu and Mpeketoni, a fact being downplayed by Kenyatta’s propaganda machine. Secondly, credible evidence points out that it is actually al-Shabab that is responsible for these attacks – as rightly pointed by multiple intelligence agencies (including British, American, Israeli, and Kenya’s own NSIS). This intelligence is being ignored in tacit complicity to achieve political goals. Uhuru is using primordial ethnic fears to directly plant the perception that “his people” are “under attack” thanks to CORD’s political rallies – hence the need for “better protection” and the need for CORD’s rallies to be stopped or blacked-out. The need for “better protection” is the context and justification for the planned militarization of security – which has little to do with security but more about control and suppression of the general populace ahead of the next general elections (and potentially unknown consequences of ICC in future). Kenyatta is essentially preparing the ground for the next round of election rigging which he suspects might turn ugly – definitely not a good sign. Make no mistake, as Oduor Ong’wen rightly points out, the planned militarization of the security sector is aimed to subvert the police reforms prescribed under the new Constitution – and allow for the backward re-moulding of security along the militarized structures thriving in neighboring dictatorships – al Bashir’s Sudan, Museveni’s Uganda, Kiir’s South Sudan, and Kagame’s Rwanda. In these countries, the opposition cannot hold a political rally in their capital cities – period! There can neither be mass protests following rigged elections in these countries. Ask Besigye of Uganda. This is where Kenyatta imagines he can take Kenya in 2014 – thanks to the spree of security confusion he is trying to implant in the national and international psyche. It is unbelievable that Kenyans are watching their own freedoms cut back by a paranoid regime whose two leaders are currently facing serious charges at the ICC. The ICC-charged leaders have DELIBERATELY galvanized their respective communities using scare-mongering and fear-peddling tactics into believing that Western powers are intent on disposing them (Gadhaffi-style). Those are the kind of anecdotes and conversations being peddled in local bars by NSIS agents – and a sizeable proportion of Kenyatta supporters are buying it. Of course, the propaganda is all pure bull-crap! With considerable local success, Kenyatta has been using such anti-Western propaganda ever since he ended up behind the dock at the ICC. We are now entering dangerous territory. The propaganda is now being used as pretext for entrenching despotism through the back-door. Kenyans are now paying the price of having ICC-charged leaders unilaterally militarizing our national law enforcement systems. Right before our eyes, the stage is being set for the next electoral rigging and subsequent violent dig to hang onto power by military force. The powder keg heightening these suspicions is evidenced by the very tribally-skewed nature of the ongoing military recruitment exercise. People need to really open their eyes to unfolding events. The greatest casualty in these unconstitutional means of running the public service will be Kenyans, our brand new Constitution, and its guarantee of new freedoms which are quickly being unwound. This change towards despotism started with the local civilian intelligence gathering scheme, the so called Kumi Kumi initiative. Next to come were plans for recruitment of tens of thousands of tribal youth under pretext of the National Youth Service. Media censorship is already active. Kenyatta likely feels he does not have enough political control over Nairobi; hence his need for militarizing the capital city with this so called Nairobi Metropolitan Military Command – to exert maximum control. The paranoid Kenyatta, nowadays riding in armoured tracks, is basically trying to re-shape the Kenyan state unilaterally – to fit into his personal whims and to accommodate his individual fears. With such dreamed control, armoured security, and militarized capital under his direct command, managing political rallies like the saba sabas, nane nanes, and tisa tisas, will presumably be quite “easy”. It does not take a rocket scientist to figure out that Kenyatta’s concentration camp of Somalis (at Kasarani) will also be dealt with more easily if law enforcement was militarized around Nairobi. I think people need to be more vigilant than they are to unfolding events! The speed at which the Jubilee government and their corporate affiliates jumped to respond (with taxpayer funds) into rebuilding devastated communities perceived to support TNA (like Mpeketoni) while ignoring other areas in Wajir, Baringo, Kajiado, Mt. Elgon, Turkana, etc is embarrassing. This skewed distribution of resources is simply sickening. This kind of stuff can be very dangerous. Starting it is very easy. State House has this evening been left deeply embarrassed after the President called off an IFTAR dinner scheduled for Leisure Lodge and organised by Mining Cabinet Secretary Najib Balala, Hon Mustafa Iddi and Kwale Women Representative Zainab Chidzuga after coastal Muslim leaders staged a mass boycott of the function that shocked presidential handlers due to perceived Jubilee Government injustices against the community. President reportedly enroute back to Nairobi after snub. And you can bet the blame will be on — your guess is right! Compare that stark reality with the skewed coverage and outright lies that Jubilee-apologist Daily Nation is trying to propagate. The Coast people and Muslims in general have refused to be duped by fake promises of fake titles when they can clearly see with their own eyes what is actually happening on the ground. Case point – the onslaught against the Lamu Governor who has refused to play ball like the latter-day hirelings in Kwale and Taita Taveta. I guess Kenyatta can brag he successfully bought off the leadership of Taita Taveta where his family occupies the most land. Na hiyo yote ni maendeleo! as Moi would say. Within one short year, Jubilee has revived the Nyayo problem of governance in Kenya. It is fundamentally premised around three vices – electoral theft, tribal-mafias, and looting of state resources. The TNA tribesmen carefully plotted to capture (forcefully retain) the state in 2013 as a central means of illegally accumulating wealth and protecting themselves from ICC’s judicial reach. Once the inner-core tribesmen of TNA cajoled one or two other ethnic chieftains (like Ruto), they cobbled this superficial Jubilee alliance that served as TNA’s vehicle to electoral theft and assault on state resources and protection. We are now living the consequences. As Kenyatta battles his ICC problems, several tribal hanger-ons promising to “defend” him (wakina Kinyua, Gichangi, Karangi, Muhoro et al) are actually in effect just trying to emulate yesteryear mafia power-wielders who turned into billionaires – like Biwott, Kulei, Murungaru, Kiraitu, Muthaura et al. The large group of tribal hangers-on within the ruling mafia today are already milking favours for state contracts and other forms of state largesse. The Joseph Kinyuas of today have tasted power and unprecedented billions in quick cash and cannot fathom losing the vantage any time soon. They need tribal shielding over their looting and ineptitude – hence the concoction of ridiculous whispers of conspiracies and scare-mongering tactics like ” Kimundu wants to overthrow our man from State House”. They know this works in galvanizing their tribal followers around them. In the process, genuine opposition pointers to their looting & ineptitude, and apt mobilization of the public towards civic participation (per the new Constitution), becomes criminalized. The Gichangis, Karangis and Muhoros of the tribal chama/Kiama called NSAC start labeling political rallies as platforms of “high treason”. Kinyua is also extending his hand into law enforcement and the Judiciary in an attempt to despotically quash political threats against their primitive accumulation of state largess. The ethnic base of accumulation has started intensifying ethnic networks in all arms of government (NSAC, Police, DPP, Solicitor General, Attorney General, Judiciary, Legislators) to sing the tune of “trying to overthrow a ‘duly’ elected government” and “treason”. Mainstream media has been coopted into the hegemonic process. The new class of TNA-linked businesses and professionals feeding from (or milking) the trough whether in the form of contracts, consultancy fees, or quid-pro-quo advertisement fees (the Ngunyis, Mbiukis, Kagwanjas, Kirubis, et al) have been summoned to append their “expertise”, scribe-pens, “analyses”, and media-outlets to amplify the tune. There is a deeply vested and selfish interest in the ethnic control of the state. Media is efficiently being used to harness primordial emotions of the mass of the tribe, which is being manipulated into believing they are indeed under real siege from their countrymen. In reality, billions of taxpayer funds are gushing from state coffers into the pockets of TNA mandarins adept at creating smokescreens…smokescreens to dupe the ICC, to dupe the West, to dupe their tribesmen, and to dupe the gullible. When Kenyatta says his “people” are under attack in Lamu not from al-Shabab, but from “the Opposition”…and when Kinyua starts intimidating the Opposition with threats of treason charges…we know the era of Nyayo is officially back. The new multi-billionaire mafia of today are sending warnings that they will do anything to preserve their milking straws that are fleecing the state…even if it means using unconstitutional Nyayo-era techniques!